My husband and I received our first invitation in London, a card for a Sunday-evening at-home from Lady Sebright, a very enthusiastic amateur actress, fond of literature and art, and who loved to gather at these Sunday-evening receptions men and women conspicuous in both callings, besides a purely social element. The evening came and we rattled up to Lady Sebright’s house in Lowndes Square in a humble four wheeler. I wore a very simple black, square-cut gown with no jewels—I had none—or ornaments of any kind, and with my hair twisted carelessly on the nape of my neck in a knot, which later became known as the “Langtry.” Very meekly I glided into the drawing room, which was filled with a typical London crush; I was presented to my hostess and then retired shyly to a chair in a remote corner, feeling very unsmart and countrified. Fancy my surprise when I immediately became the center of attraction, and after a few moments, I found that quite half the people in the room seemed bent on making my acquaintance. One distinguished person after another was led up to my corner by my hostess, they in turn bringing others, till my shyness and confusion gave way to utter astonishment at finding myself singled out for such marked attention. One of the first to be introduced was John Everett Millais, probably the most eminent English painter of the day, a native of Jersey, where I was born, and who beamed in friendly enthusiasm while he claimed me as his countrywoman. He was tall and broad shouldered; his handsome, ruddy, mobile countenance was strong rather than sensitive in character, and his swinging walk suggested the moors and the sportsman. Manly is the only word which will accurately describe the impression he made. Later, when I came to know him better, I discovered that he affected none of the eccentricities, either of dress or manner, usually ascribed to artists, that he was quite sane, and that in his working hours he did not wear a velvet jacket, but a well-worn, homespun, belted coat, which I am sure had done yeoman service on his beloved Scottish moors. In a word, he was as natural as if he were not a genius. There was a rush of cavaliers to take me down to supper, but Millais won the day, of which I was glad, for I was fearfully shy, and his gay assumption of kinsmanship made me feel more at ease with him than with others I had met that evening. He asked me to sit for him, and his compelling personality made me readily consent that he should be the first painter to reproduce on canvas what he called the “classic features” of his countrywoman. And so ended my first night in London society. This wonderful experience was still fresh in my mind the next morning, and I felt nothing could eclipse it, but in the afternoon, on returning to our rooms in Eaton Place after a walk, Mr. Langtry and I found the table heaped with cards and notes of invitation—to dine, to lunch, to dance—from people whose distinguished names were familiar, but who themselves were personally unknown to us. A complete transformation seemed to have taken place in my life overnight. It was quite staggering, and thenceforward visitors and invitations continued to pour in daily until they became a source of grievance to our landlady, who was obliged to engage an extra servant to respond to the battering of powdered footmen on her humble and somewhat flimsy door. 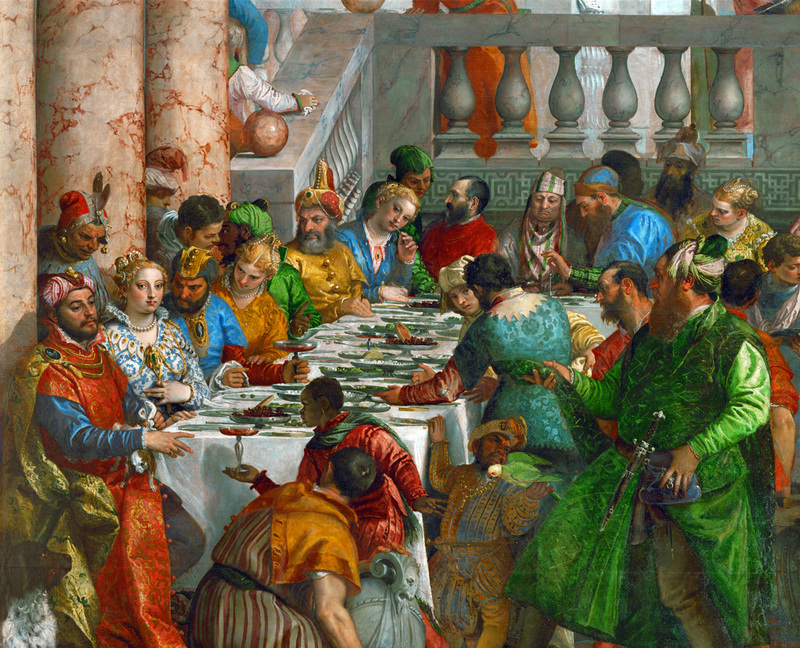 Sultan Süleyman I, Emperor Charles V, King Francis I, from Marriage at Cana (detail), by Paolo Veronese, c. 1562. Louvre Museum, France. Invitations to receptions and balls were so numerous that we were mostly obliged to attend two or three of each in an evening in order to keep our engagements. Whatever my husband said and felt, I absolutely reveled in the novelty of it all, and though at this distance of time I cannot call to mind details, there was scarcely a great house in London that I did not visit during my first season. At these various gatherings I met practically all the well-born and well-known men and women of the day, and the point most apparent in connection with them was their entire lack of self-assertion. While I carried away with me from these functions a general sense of pomp and grandeur, there was a simplicity about the people which one finds only in those born to greatness, or who have achieved it. Probably the security of their station enabled them to be charming and gracious. Certain it is that they were absolutely free from the affectation and “smallness” which, sooner or later, make their appearance in many who merely buy a position with money. It would be difficult for me to analyze my feelings at this time. To pass in a few weeks from being an absolute “nobody” to what the Scottish so aptly describe as a “person,” to find myself not only invited to but watched for at all the great balls and parties, to hear the murmur as I entered the room, to be compelled to close the yard gates in order to avoid the curious, waiting crowd outside, before I could mount my horse for my daily canter in the Row—and to see my portrait roped round for protection at the Royal Academy—surely, I thought, London has gone mad, for there can be nothing about me to warrant this extraordinary excitement. I felt apologetic and inclined to disclaim aloud any hand in bringing about the strange attitude of all classes in London toward me. Indeed, there were many simple amusements I was now forced to forego that I had enjoyed in my “nobody” days. My husband greatly disliked all this publicity, sometimes losing his temper and blaming me! As can be readily understood, his position was an onerous one, for, aside from the vexation of seeing his wife stared at as a species of phenomenon, we never went out but that he was kept busy hurrying me from one place to another as he saw the familiar crowds beginning to assemble. Still, it is easy to imagine the marvel of it all to a country girl like me, who had not been allowed by my band of brothers to think much of myself in any way. I had occasionally stood and studied photographs of the recognized beauty, Lady Dudley, which had found their way into the little stationer’s shop of St. Heliers in Jersey, and I sometimes wondered what it must be like to be such a great and fashionable beauty. And so, when I realized that people were even acquiring the habit of standing on chairs in crowded drawing rooms for a glimpse of me, is it surprising that I thought it uncanny? Known as “the most beautiful woman in the world,” Langtry had her portrait painted by both John Everett Millais and James McNeil Whistler, and Oscar Wilde once said of her, “I would rather have discovered Mrs. Langtry than to have discovered America.” Married to a wealthy Irishman, she was mistress of the Prince of Wales, later King Edward VII. Through her society connections she befriended Sarah Bernhardt, who convinced her to try acting; she made her debut at London’s Haymarket Theatre in 1881.